Oh! Thanks a lot! Are you working with vectors too? I hope that answers your question, and if you had any more don't doubt to ask, and sorry again! I give up. Who's Aquamentus? 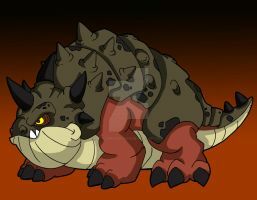 hehehe, in case that this is not a joke... he was the very first boss of the very first Zelda. It's not a joke. The earliest LoZ games I played were on N64 and Game Boy Color. A Link To The Past was the earliest one from Nintendo's archives I'd played, but I first saw it in its GBA remake. But alas, I digress. Dragons are a staple for any adventure game, aren't they? Wow your stuff is really amazing and original! Thanks, glad that you like it, and thanks again for the comment!